When looking for accommodations at Disneyland, Disney Grand Californian Resort and Spa is a great place to stay! Offering a private entrance to California Adventure (hello toddler naps! ), an extra Magic Hour at either Disneyland Parks, and rooms with gorgeous balcony views of the parks! 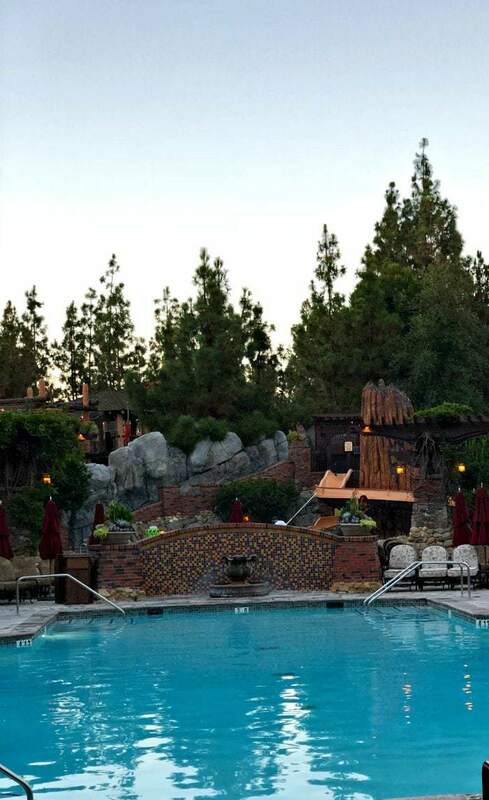 We recently spent three luxurious nights hosted by Disney at the Grand Californian Resort and Spa. Prior to our visit, I wasn’t super familiar with the property, especially since it was our family’s first visit to Disneyland. We flew in to John Wayne Airport and took the Disneyland Express to The Grand Californian Resort and Spa. I loved the Disneyland Express as it was a large bus and we didn’t have to deal with car seats, a rental car, or parking. The hotel is only about 15 minutes fro the John Wayne Airport, and the ride with stops took only about a half hour. We were dropped off at the Paradise Pier and offered an SVV ride to the Grand Californian, but we opted to walk. Arrival at the Disney Grand Californian was amazing- the hotel is themed like an California Lodge, and the entrance is multiple stories high (I think like 5). There were tons of people working to make sure our check in was amazing- we hardly waited in line and a concierge checked me in and answered a zillions questions- even making sure that I was set up on the app to enter the park easily. The hall was decorated in Halloween decor since we visited during the annual Halloween Time celebration, complete with a huge powered sugar pumpkin display that smelled delicious., The best part? 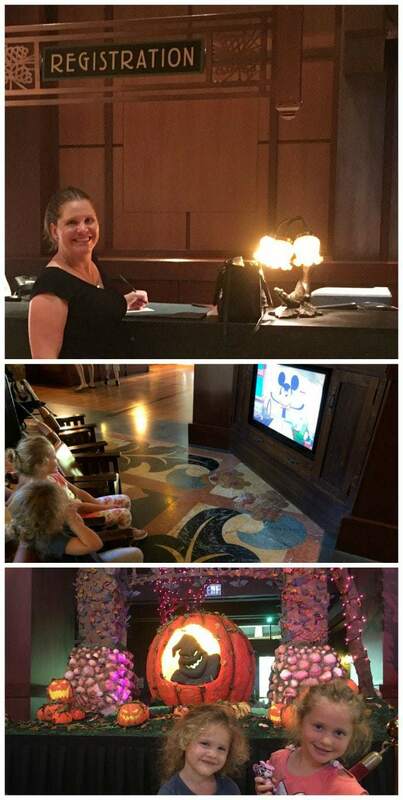 There were kids’ sized rocking chairs in front of Mickey cartoons so the kids stayed entertained while I took my time checking in, and there was ice cold lavender and lime water for us to sip on after a long morning of traveling. The room came with a little Mickey stool so the girls could wash their hands without help. The shower had a handheld shower massager AND an overhead shower head, making it easy to do a rinse off after grungy park days when we didn’t want to wash hair. The view- I highly recommend getting a park view- we could see the Disneyland fireworks at the end of each night, and the morning sunrise was amazing. I loved the lightning! The blackout curtains over the balcony really did make the room dark (we actually took along a night light for our three year old who gets scared of the dar) and so we were able to take awesome midday naps. The lights along the ceiling and in the bathroom were dimmable and there were individual reading light above each bed. The room included a super nice mini-fridge and Keurig coffeemaker, a clothing steamer and extra blankets. Super comfy! There’s also microwaves on every even floor near the lobby, so we made oatmeal a couple of mornings that we wanted to scoot off to the Magic Hour and not mess with eating out. Finally, the highlight of our stay for my 5 year old was the turndown service. Each night we came back for the parks and the beds had been made, the television turned on to soothing music (they even had an adorable bedtime stories channel! And there were Ghirardelli chocolates on each pillow. I swear the kids talk more about the chocolates than anything else on the trip! My favorite part of the accommodations? Walking literally 50 feet to our own private entrance to California Adventure. This saved us so much time and energy- and allowed us to take naps in the afternoon super easily before returning to the parks for the evening shows ad excitement. The biggest reason, in my opinion, to stay at a Disneyland Resorts property like the Grand Californian is because of the Magic Hour. Each day either Disneyland or California Adventure opens an hour early and only guests of Disneyland properties can enter the park for that hour. With our room key and the private California Adventure entrance fro the Grand Californian, we were able to head into the parks to ride TONS of rides that normally have long wait times, all before the parks were even open to the public. The Magic Hour each day was one of the most special times of our visits- especially when we rode Ariel’s Undersea Adventure multiple times without ever getting off, and explored the parks when there were virtually no other people there. It’s the best! 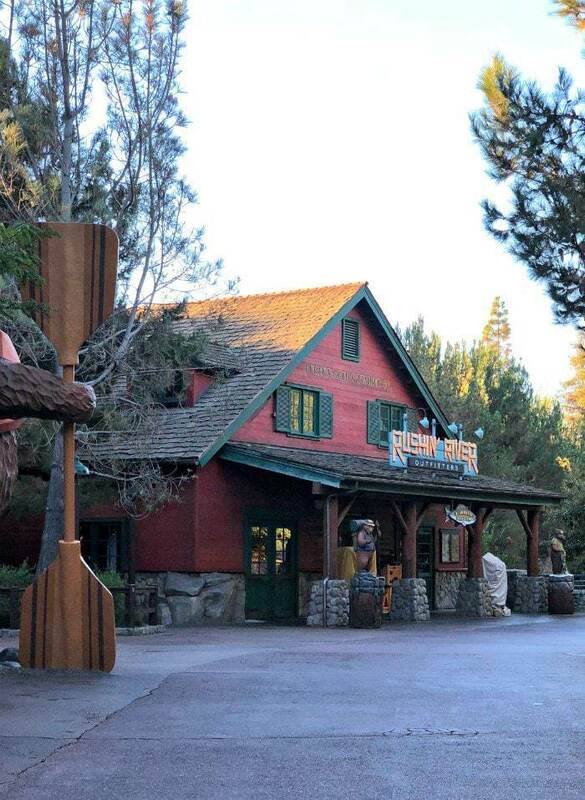 There are several dining options at the Disney Grand Californian Resort and Spa, and of course it’s also adjacent to Downtown Disney which gives tons of options. 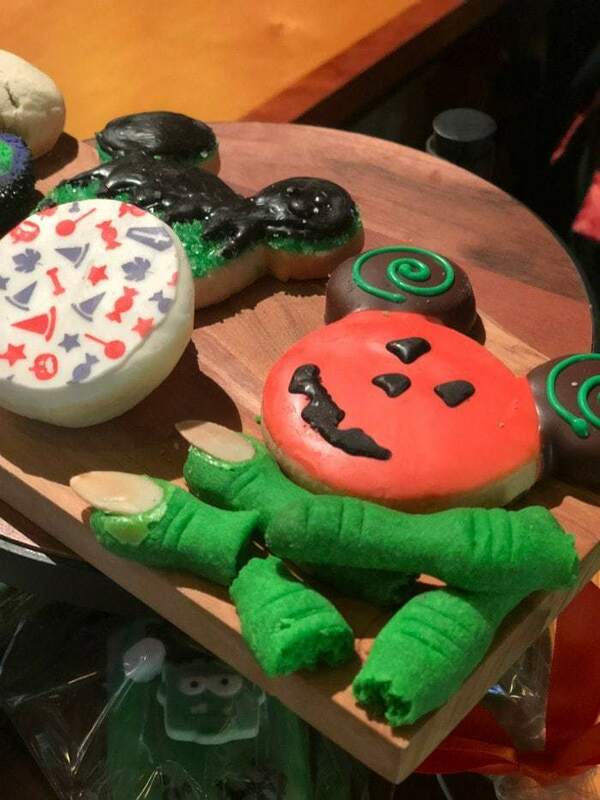 There is a fine dining spot called the Napa Rose, and a fun Great Hall cart with seasonal snacks (we loved the Halloween Time treats from here! ), a fast food type snack bar called White Water Snacks (their pizza was delicious) and the Storytellers Cafe which serves a nice breakfast, lunch, and dinner. 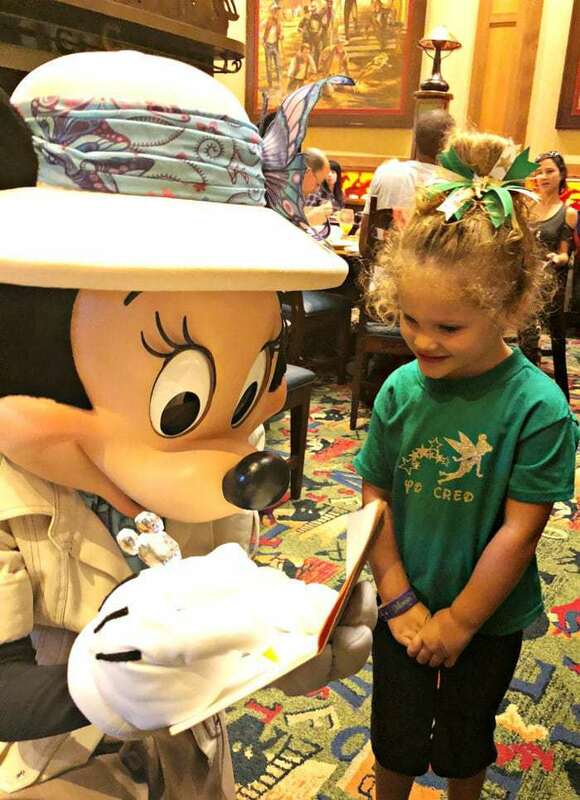 We experienced the Mickey’s Tales of Adventure character breakfast at the Storyteller’s Cafe, which had a great buffet and was a super fun experience for the girls to meet their favorite characters. There are so many activities to participate in at the Disney Grand Californian Resort and Spa that I wished we had stayed an additional day just to do all the fun extras! When we checked in we received a calendar of events for the month that included the daily activities schedule. There’s even a daily family movie night! The hotel has three awesome pools, one with a water slide- and we never even got the chance to experience them because we were so enthralled with the parks. So I’d definitely like to go back to spend a pool day. There’s also daily mat pilates on the pool deck at 10:30 am, which would have been awesome to go to as well. I was most excited about the morning Get Up & Go Power Walk through California Adventure- you can spend an hour power walking through the park (no cameras, it’s just for exercise) and enjoy the sunrise. You have to make a reservation for this, and it fills up fast, so I would recommend making the reservation before you leave or right when you check in to the hotel. There’s also early morning stretching and a fabulous gym that’s open 24/7. There’s also a spa on property- which I did not have time to explore but I would seriously consider making this a girls’ trip destination- one pool day, one park day, one spa day! Who’s in? When we were first walking the halls to our room, we saw a lot of rooms with fun signs that said “First Visit to Disneyland” or “Happy Birthday”- and we were all intrigued. I learned that Disney offers a super cool service by Disney Floral and Gifts where you can have different themed packages in your room upon arrival. 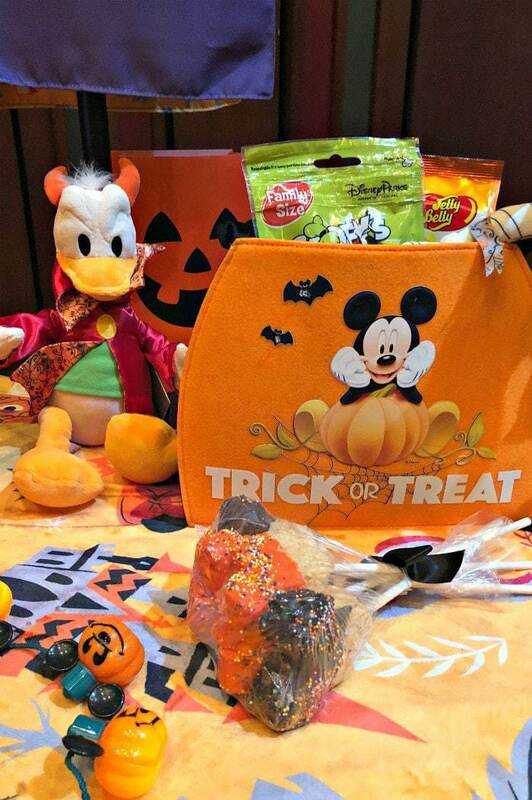 We got an inside look at the Halloween Celebration package and I wish i had known about it before we arrived! Super cute- you can learn more about personalized packages, pricing, and how to order on the Disney Floral and Gifts website. The Disney Grand Californian Report and spa definitely comes with a heftier price tag than other hotels, but I think it was totally worth the extra. 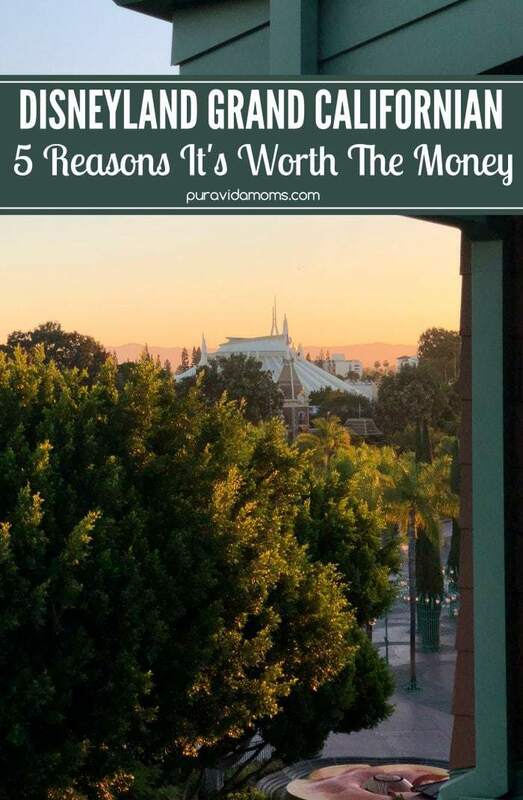 Between the private entrance to the park (which allowed us to nap), the Magic Hour which allowed us early access to the park, and the super comfortable surroundings, I would definitely stay here on our next Disneyland trip! Disclosure: Disneyland hosted our family at Halloween Time over multiple days for the purpose of this coverage. All opinions are entirely my own.